Barkworthies Femur Bones are baked with pieces of meat and tendon still attached, so your pup is in for a terrifically appetizing time! Center cut from the femur and full of nutritious marrow, they provide your dog with a highly digestible source of calcium. Calcium intake is crucial for your dog’s body to maintain strong bones and teeth. These bones are also rich in iron and zinc which helps your dog's body fight off infection, maintain a healthy immune system, provides energy to help support brain functions, and gives them a zest for life. Our Femur Bone is a hearty, durable chew that will give your dog hours of chewing satisfaction as well as cleaner teeth. It’s great for aggressive chewers and sized right for medium to large breeds. 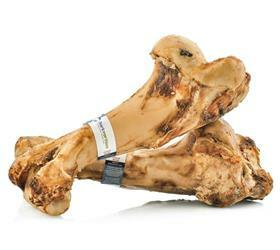 These bones are USDA & FDA inspected & approved. Please note that this product is not for human consumption. Please supervise your pet while giving a treat or chew. Barkworthies Femur Bones are additive-free, chemical-free, and preservative-free, just like all Barkworthies chews and treats. Moreover, most Barkworthies products are single-ingredient chews, which means they’re 100% healthy and safe.